While most believe online education is easy as the student is just sitting in front of the computer, attending class online is more challenging than attending class in a classroom because requires time management skills and requires self-discipline. Attending college online requires the college student to have excellent time management skills. The majority of online students have responsibilities other than attending school. Usually this is why the decision to attend school online is made. The online student must be able to balance school, work, and a family. Attending school at a traditional school is not as flexible as the time schedule is set in place and the student must arrange their schedule around school, work, and family. Online education allows more flexibility in the online class schedule. However, proper management must be maintained in order to balance all of the responsibilities and be successful in all areas. “Not only do students need to monitor their progress in an ongoing fashion and adjust their strategies for learning based on their progress, they also need to maintain a time management schedule in order to complete online learning activities in the allotted timeframes. ” (Orellana, Hudgins, & Simonson, 2009, p. 470). The online student must be able to continue to work full-time and take care of family. All of these things must be done including attending school. Adding online education to the list of responsibility may assist the online student becomes well organized. An online student can possibly check-in the online classroom during lunchtime while at work. Homework assignments can be done during “homework hour” at home with the children. In order to be successful attending school online, the online college student must practice self-discipline. In a traditional classroom, the student the instructor holds the student accountable for all assignments and participation in class. While the same applies for the online college student, accountability is the student. There will not be a “reminder” from the instructor on a daily basis whether the student is participating in the discussion group or if the student has completed an assignment. “Online learning can be more convenient, effective and rewarding than traditional classes, but convenience doesn’t mean it’s easier,” says Gwen Hillesheim, interim chief academic officer and provost of Colorado Technical University, a leading provider of education for career-motivated students. “Successful online students need to be proactive in their studies and take responsibility for their own learning. It takes self-discipline and time management to do your best. But when the student is engaged, the learning can be significant and the experience fulfilling. ” ARA, (2010, November 3, Creston News Advertiser). Online students must comply with the University participation requirements in order to succeed. Self-discipline is required as it is solely up to the student to log in each day and participate in class. Unlike traditional classrooms where the schedule is set and students are reminded by staff daily to participate; the University notifies online students that do not make the required participation requirements after they have failed to do so. Most individuals that opt to attend school online are returning to school to complete a college degree. Usually this option is chosen due to work schedule as well as time with the family. Online education is not for everyone as it takes great discipline and maturity in order to be a successful online student. “At the same time, online education is not for everyone — you have to have a certain level of maturity and self-motivation, since you have to juggle coursework with job and family responsibilities. It demands a great deal of individualized work and you have to manage your schedule to meet class requirements rather than attend at a specific time of the week. “Michele Smolik, Director of Instructional Technology at Columbia College. Traditional students usually are not full-time employees. A person attending a University on campus is usually either taking one class or a full-time student working a part-time job. Online education allows an individual to maintain a full-time job however in order to qualify as a full-time student two classes are taken at a time. Traditional students attending class on campus have the advantage of accessing the instructor during class instruction if a question should arise. Online students must communicate with instructors via email or by utilizing the message board located on the student portal. This type of learning is not the right choice for everyone as some need individual instruction. Some argue that online students are “teaching” themselves, as there is no verbal instruction from an instructor. At most online universities instruction is given weekly during the discussion group forum by the instructor. The online student must make it a responsibility to participate in weekly discussion forums as well as keep up with weekly readings. Students that delay themselves in participating in the discussion group usually maintain a low grade. All of this is vital in order to be a successful online student. Assignments for class are usually due weekly and due at the end of the week. Students must submit the assignment via the class portal. It is imperative that the student have the correct software in order to submit the assignment as it is the student’s responsibility that the assignment is submitted on time with no exceptions. This is not an issue for traditional students as instructors are able to accept assignments in person from students. 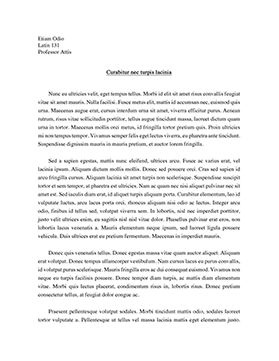 Essays and other assignments can be submitted by hard copy, which eliminates the concern of computer complications or the non-compatibility of software with the University. Online education has been debated throughout the years of its brief existence however most will agree that it is much more challenging than traditional education. Attending school is challenging whether in a traditional classroom setting or attending school online as responsibility is the main factor. However, as an online student it is imperative to be organized, responsible, and maintain strict discipline in order to be a successful online student. These factors make attending school online much more difficult as it is magnified much more. References The Perfect Online Course: Best Practices for Designing and Teaching (Orellana, Hudgins, & Simonson, 2009, p. 470) ARA, (2010, November 3). Nowadays, education becomes one of the important things in human life. Most of people are aware to obtain the education. Beside that, every country always concern on developing the quality of the education to improve the human resources. If the quality of human resources of a country is good, indeed, the quality of that country will be good too. As the matter of fact, we cannot deny that the improvement of technology really influence the education itself. Last time, before the advance of technology, the implementation of education system is still traditional. But, it is different nowadays. The implementation of the education is not only traditional but also online. Both of them have several similarities and differences; one similarity in terms of books and paper factors and two differences in terms of cost and level playing field. Not only the similarity, traditional education and online education also have differences, two of which are cost and level playing field. Now, we are going to the first difference which is deal with cost. The students who attend the school which implemented traditional education will spend much more money. If their house is not near from their school, they will spend their money for buying gasoline for their private transportation. It will be the same if they do not have any private transportation because they have to pay public transportation to go to school. Moreover, if the distance between their house and their school is too far and they do not have any relation, they must rent a house or at least live in a boarding house. That will spend much more money because they have to pay not only for renting or boarding house but also for food. On the other hand, online education is cheaper than traditional education. For instance, the students who live far from their school do not need to spend a lot of money for transportation. They can study anywhere as long as they have computer and internet access. Beside that, the students from other city or island do not need to live in a boarding house or rent a house and pay for it. They can still live in their house and do not need to buy food for themselves. Another difference between traditional education and online education is level playing field. The students of traditional education must come to the class for study. Thus, there are some discrimination in it. It gives the limitation for those who are disabilities to attend the class. Moreover, there are several gaps between students who are different in terms of physical appearance, race, gender, etc. That is why some students fell uncomfortable when they study in class. Not only that, the students who are introvert feel shy to express their idea in front of the class. In contrast to traditional education, there is no discrimination in online education system. “Certain discriminating factors such as age, physical appearance, race, gender, and even disabilities are largely absent from online education classes. Many students find this open and accepting atmosphere very liberating.” (http://www.onlineeducation.com/resources/) As the matter of fact, the students of online education do not need to come to class for studying. Thus, no matter who they are, can study without any burden or feeling shy. They can be active and feel comfort to share their idea in disccussions. In sum up, there are several similarities and differences between traditional education and online education. One of the similarity is in term of books and papers factor and two of the differences are in terms of cost and level playing field. However, both of them are still exist today. For those who want to attend the school, they can choose the school which implemented traditional education or online education by considering my explanation above. Super specialization distance learning programs for placements? Interesting blog and I really like your work and must appreciate you work for the forward my address good work. Is Bilingual School Good or Bad? Is Online Instruction an Efficient Form of Education? Online or Face-to-Face Instruction: Which is Preferred?